Showing items in category Tokelau, sorted by newest listed first. 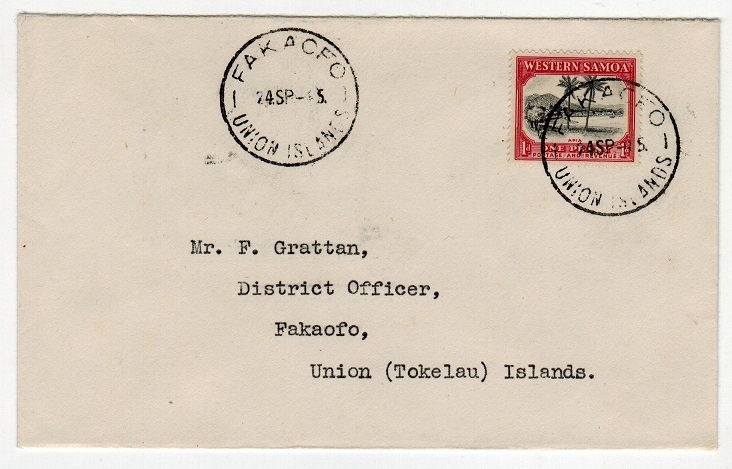 TOKELAU - 1935 3d rate cover to New Zealand used at ATAFU. 1935 (NO.19.) 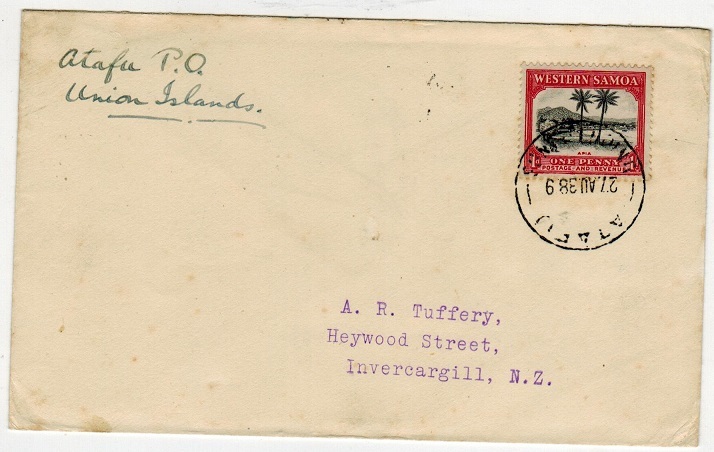 cover addressed to New Zealand bearing Samoa 1d and 2d adhesives tied by ATAFU/ UNION ISLANDS cds with a further strike at left and APIA/WESTERN SAMOA transit cds on the front dated 26.NO.36. and also a strike on reverse. A scarce genuine piece of mail. 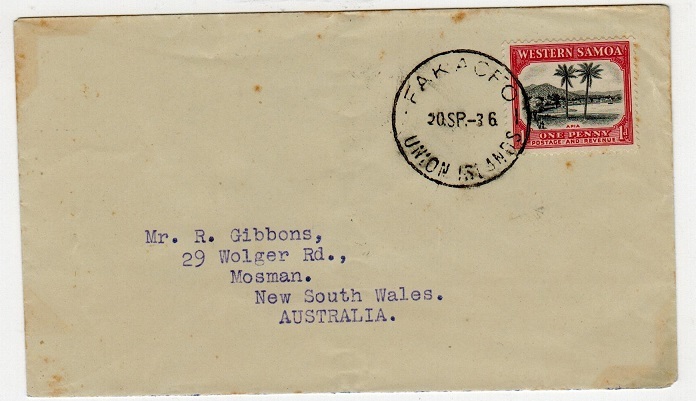 TOKELAU - 1936 1d rate cover to Australia used at FAKAOFA. 1936 (SP.20.) 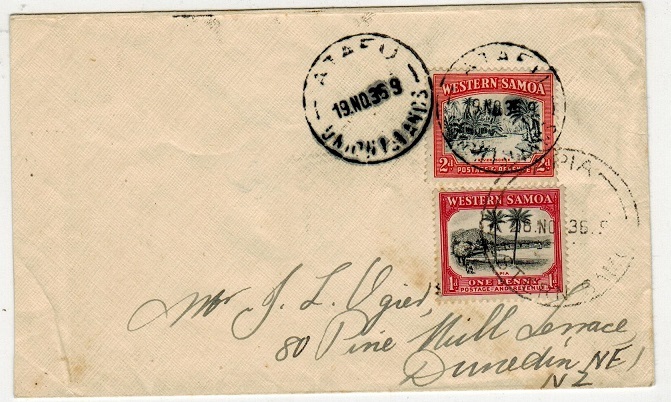 cover addressed to Australia bearing Samoa 1d tied by FAKAOFO/UNION ISLANDS cds. TOKELAU - 1938 1d rate cover to New Zealand used at ATAFU. 1938 (AU.27.) 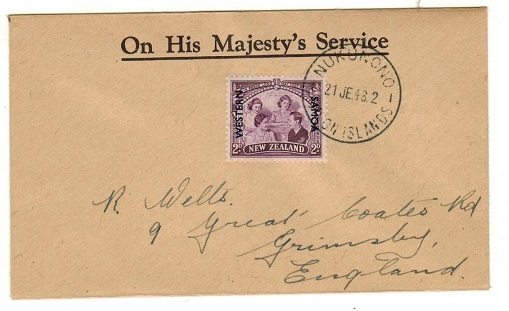 cover addressed to New Zealand bearing Samoa 1d adhesive tied ATAFU/UNION ISLANDS. TOKELAU - 1948 2d rate cover to UK used at ATAFU/UNION ISLANDS. 1948 (JE.21.) 1d 'pictorial' pair of Samoa on O.H.M.S. 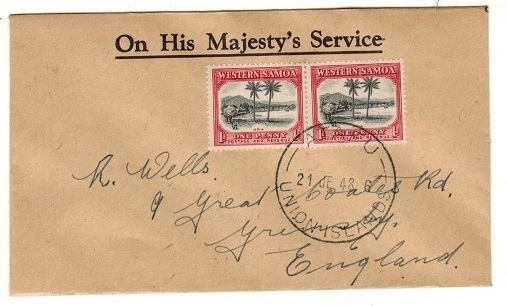 envelope addressed to UK (Wells) cancelled by ATAFU/UNION ISLANDS cds. TOKELAU - 1948 2d rate cover to UK used at FAKAOFA/UNION ISLANDS. 1948 (JE.21.) 1d 'pictorial' pair of Samoa on O.H.M.S. envelope addressed to UK (Wells) cancelled by FAKAOFA/UNION ISLANDS cds. TOKELAU - 1948 2d rate cover to UK used at NUKUNONO/UNION ISLANDS. 1948 (JE.21.) 2d adhesive of Samoa on O.H.M.S. 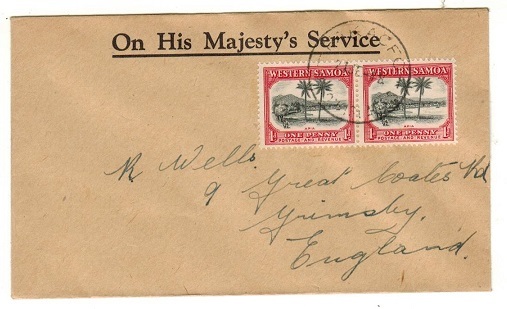 envelope addressed to UK (Wells) cancelled by NUKUNONO/UNION ISLANDS cds. 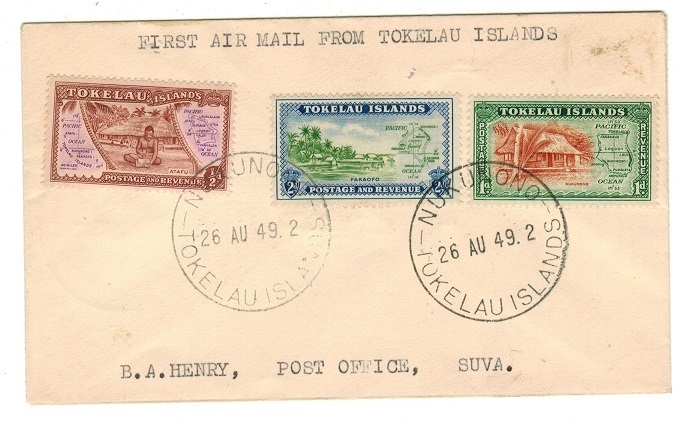 TOKELAU - 1949 first flight cover to Fiji. 1949 (AU.26.) 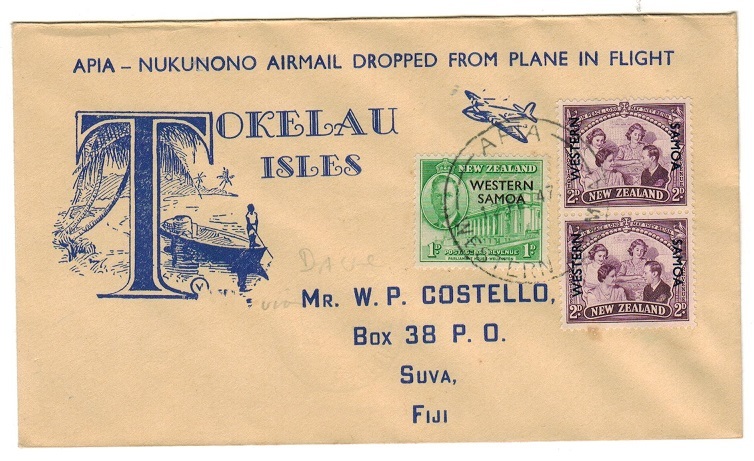 first flight cover addressed to Fiji bearing the 1948 trio (SG 1-3) tied by two strikes of the NUKUNONO/TOKELAU ISLANDS cds with APIA transit and SUVA arrival b/s. A scarce survey flight by Catalina flying boat No.5 squadron of the R.N.Z.A.F. at Lauthala Bay. The numbers flown were not recorded but examples are scarce. TOKELAU - 1945 1d rate local cover used at ATAFU/UNION ISLANDS. 1945 (SP.67.) 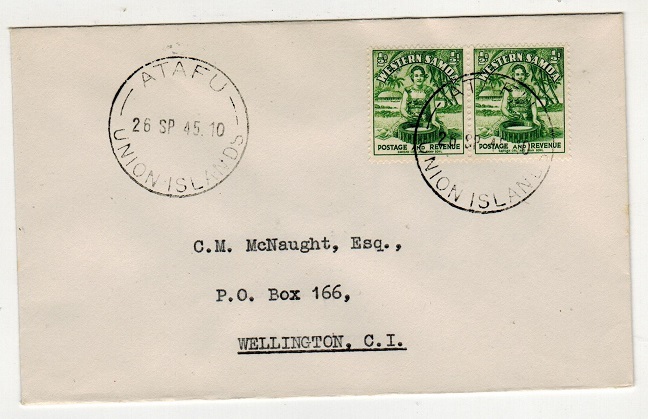 local cover addressed to New Zealand bearing Samoa 1/2d green pair tied by ATAFU/UNION ISLANDS cds. TOKELAU - 1945 1d rate local cover used at NUKUNONO/UNION ISLANDS. 1945 (SP.27.) 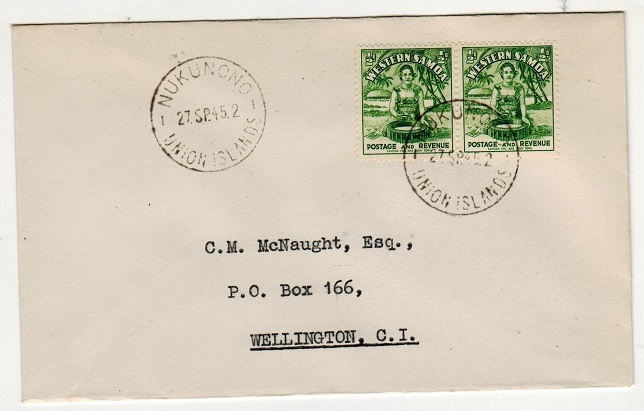 local cover addressed to New Zealand bearing Samoa 1/2d green pair tied by NUKUNONO/UNION ISLANDS cds. 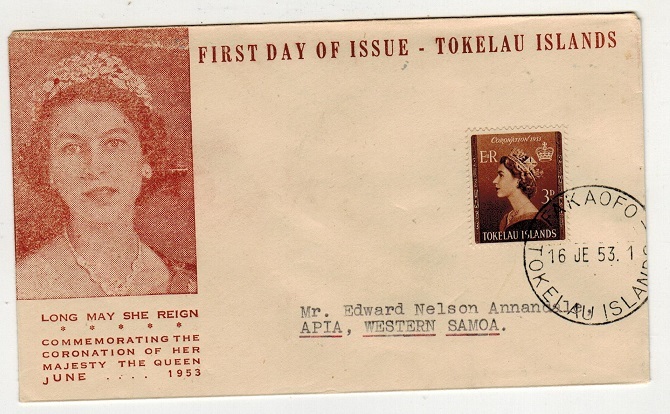 TOKELAU - 1953 illustrated 'Coronation' cover to Samoa used at FAKAOFO. 1953 (JE.16.) illustrated 'QEII Coronation' cover addressed to Samoa bearing 3d adhesive tied by FAKAOFO/TOKELAU cds. TOKELAU - 1953 illustrated 'Coronation' cover to Samoa used at NUKUNONO. 1953 (JE.16.) 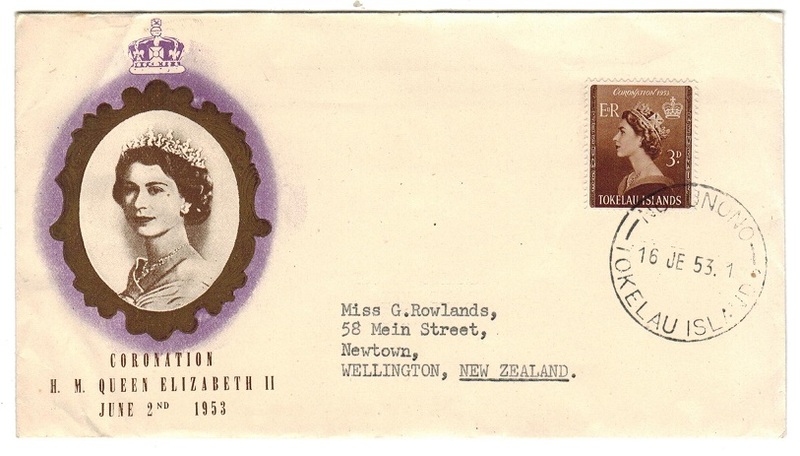 illustrated 'QEII Coronation' cover addressed to Samoa bearing 3d adhesive tied by NUKUNONO/TOKELAU cds. SAMOA - 1947 first flight cover from APIA to Tokelau. 1947 (FE.12.) 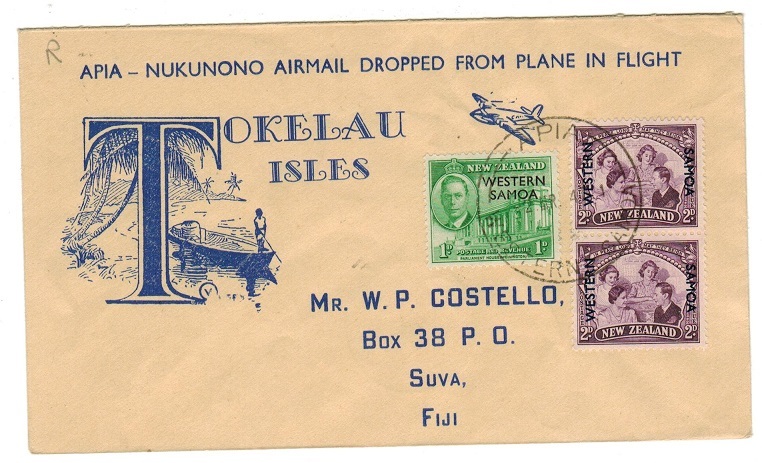 illustrated first flight cover on pre-addressed envelope to Fiji but air dropped at Tokelau Island bearing 1d and 2d (x2) adhesives of New Zealand overprinted WESTERN SAMOA and cancelled by APIA/WESTERN SAMOA cds. NUKUNONO/UNION ISLAND arrival b/s dated 13.FE.47 Only 84 covers were flown. 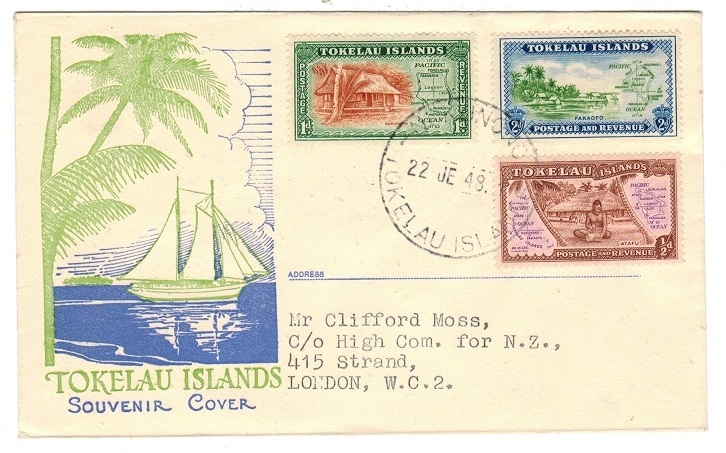 TOKELAU - 1948 multi franked cover to UK used at NUKUNONO/UNION ISLANDS. 1948 (JE.21.) cover addressed to UK (Berry) bearing 1/2d, 1d, 2d and 2 1/2d adhesives tied with 3d on 1 1 1/2d provisional by NUKUNONO/UNION ISLANDS cds's. TOKELAU - 1934 1d rate cover to New Zealand used at FAKAOFO/UNION ISLANDS. 1934 (OC.15.) 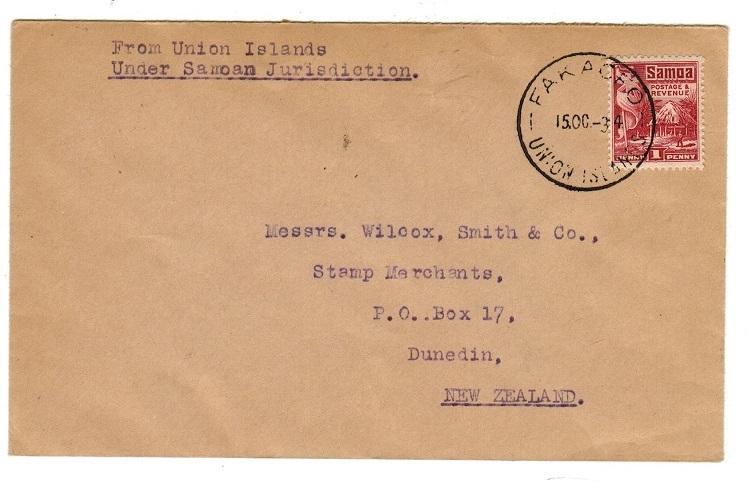 cover addressed to New Zealand bearing Samoa 1d adhesive tied by FAKAOFO/ UNION ISLANDS cds and marked at left 'From Union Islands/Under Samoan Jurisdiction'. The '3' in the year slug being inserted in manuscript. A scarce early Tokelau cover. TOKELAU - 1947 (MR.2.) first flight cover to Fiji. 1947 (MR.2.) inward illustrated first flight cover addressed to Fiji pre-printed 'Apia-Nukunono Airmail Dropped From Plane In Flight' bearing Samoa 1d and 2d pair tied APIA/WESTERN SAMOA. Fine NUKUNONO/UNION ISLAND backstamp dated 3.MR.47. Somewhere around 150 covers were flown. TOKELAU - 1945 local cover with Samoa 1d used at FAKAOFO. A scarce internal usage. 1945 (SP.24.) 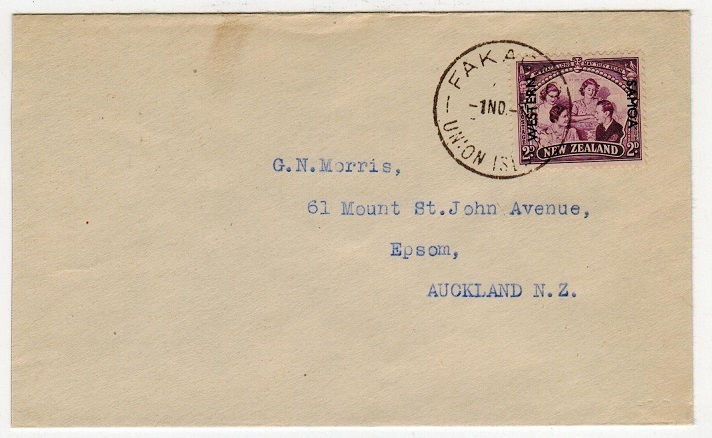 cover addressed locally to the District Officer at Fakaofa bearing Samoa 1d adhesive tied by FAKAOFO/UNION ISLANDS cds with a further strike at left. TOKELAU - 1946 cover to NZ with Samoa 2d use at FAKAOFO/UNION ISLANDS. 1946 (NO.1.) cover addressed to New Zealand bearing Samoa 2d 'Peace' adhesive tied by FAKAOFO/UNION ISLAND cds. TOKELAU - 1939 use of Australian 1 1/2d adhesive ay FAKAOFO/UNION ISLANDS. 1939 (JA.22.) 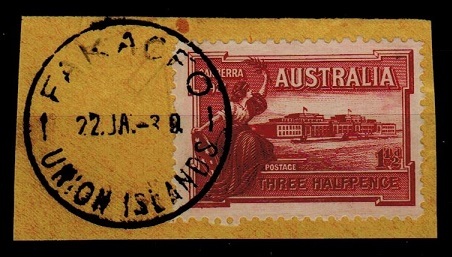 use of Australian 1 1/2d 'Caneberra' adhesive (SG 105) tied to small piece by complete FAKAOFO/UNION ISLANDS cds. A unusual use. TOKELAU - 1948 cover to New Zealand used at ATAFU. 1948 (JE.21.) 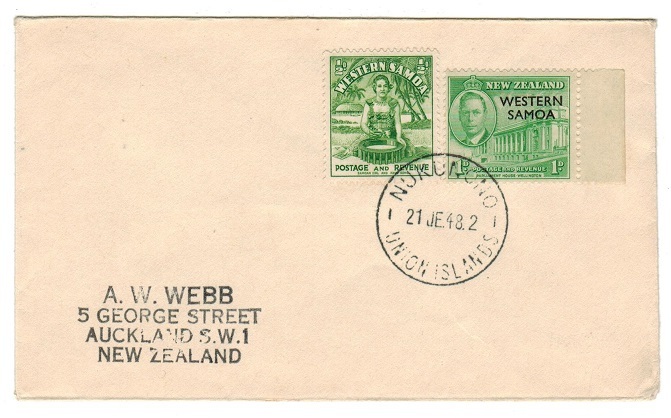 cover addressed to New Zealand bearing Samoa 2d adhesive tied by ATAFU/UNION ISLANDS cds. TOKELAU - 1948 cover to New Zealand used at FAKAOFO. 1948 (JE.21.) 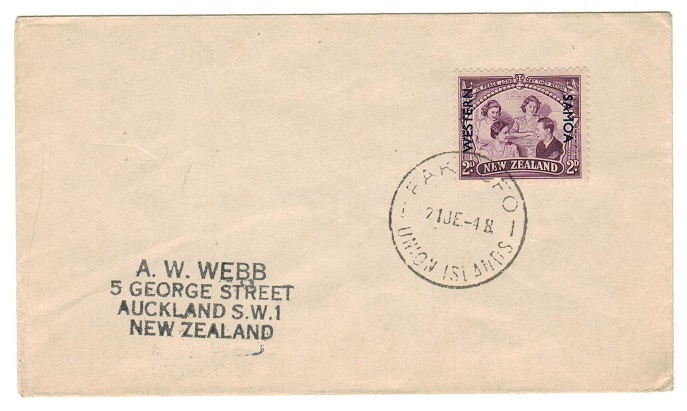 cover addressed to New Zealand bearing New Zealand 2d adhesive overprinted WESTERN/SAMOA and cancelled by FAKAOFO/UNION ISLANDS cds. TOKELAU - 1948 cover to New Zealand used at NUKUAONO. 1948 (JE.21.) 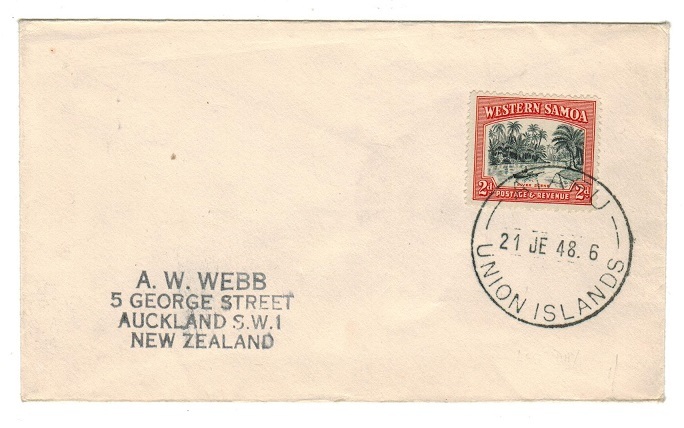 cover addressed to New Zealand bearing New Zealand 2d adhesive overprinted WESTERN/SAMOA and cancelled by NUKUAONO/UNION ISLANDS cds. 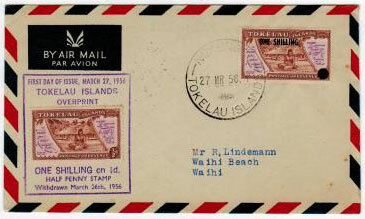 TOKELAU - 1946 'Peace' last day of issue cover used at NUKUNONO. 1948 (21.JE.) 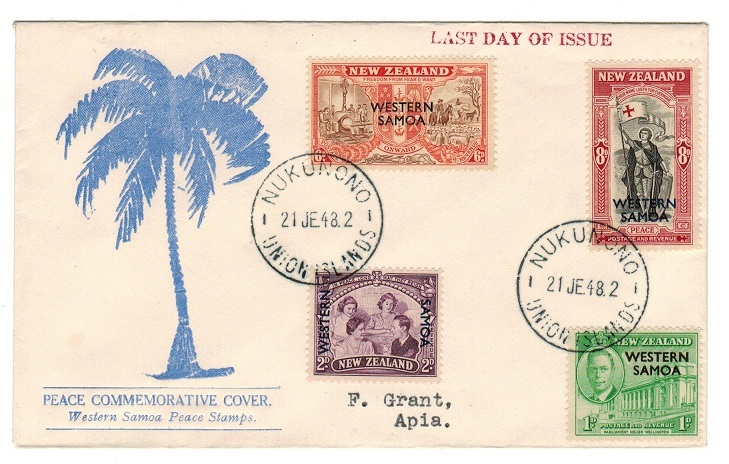 illustrated 'Peace' cover depicting 'palm' bearing Samoa set of four (SG 215-218) cancelled by NUKUNONO/UNION ISLANDS cds and struck at top LAST DAY OF ISSUE in red. TOKELAU - 1946 'Peace' issue 'First Day' cover used at NUKUNONO. 1946 (NO.2.) 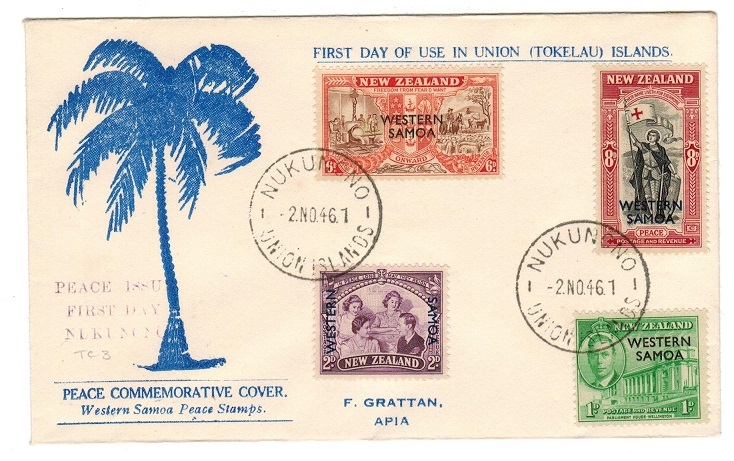 illustrated 'First Day Of Use In Union (Tokelau) Islands' cover addressed to Apia in Samoa and bearing the Samoa 'Peace' set of four tied by NUKUNONO/UNION ISLANDS cds with violet PEACE ISSUE/FIRST DAYNUKUNONO h/s applied at lower left corner. 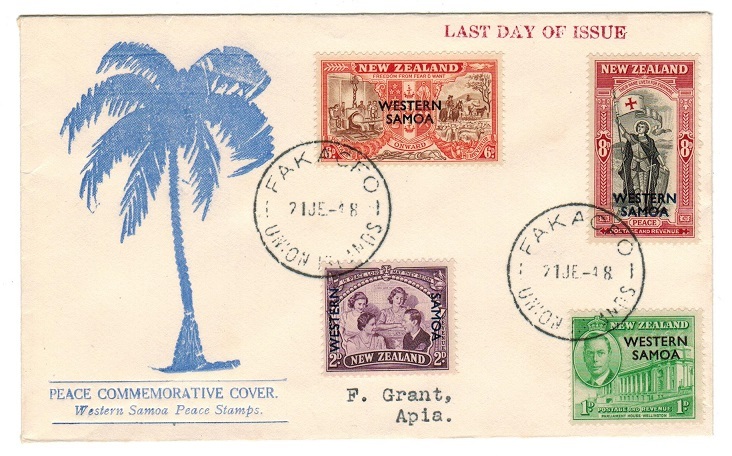 TOKELAU - 1948 'Peace' last day of issue cover used at FAKAOFO. 1948 (21.JE.) 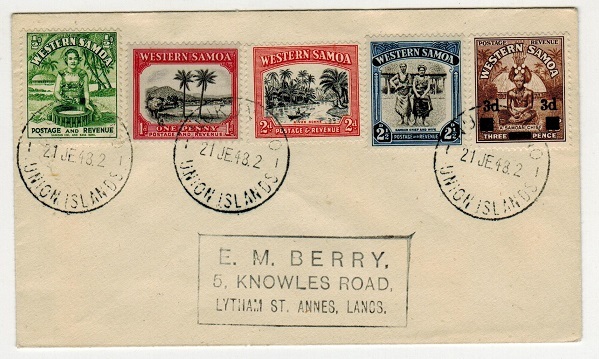 illustrated 'Peace' cover depicting 'palm' bearing Samoa set of four (SG 215-218) cancelled by FAKAOTO/UNION ISLANDS cds and struck at top LAST DAY OF ISSUE in red. TOKELAU - 1946 'Peace' issue 'First Day' cover used at FAKAOFO. 1946 (NO.1.) illustrated 'First Day Of Use In Union (Tokelau) Islands' cover addressed to Apia in Samoa and bearing the Samoa 'Peace' set of four tied by FAFAOFO/UNION ISLANDS cds with violet PEACE ISSUE/FIRST DAY/FAKAOFO h/s applied at lower left corner. TOKELAU - 1948 'Peace' last day of issue cover used at ATAFU. 1948 (21.JE.) 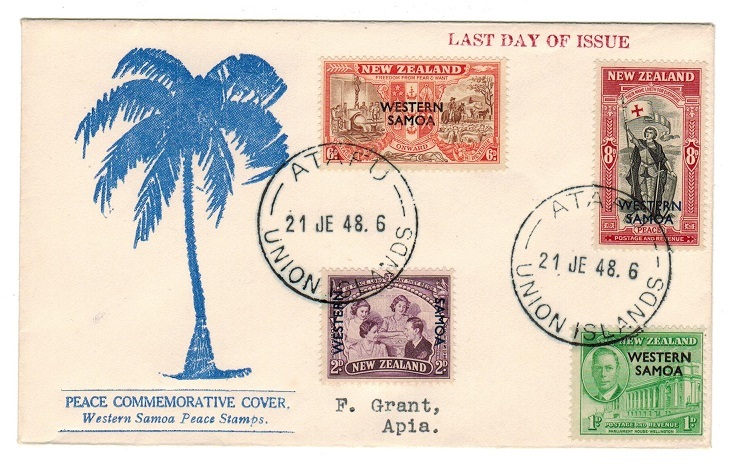 illustrated 'Peace' cover depicting 'palm' bearing Samoa set of four (SG 215-218) cancelled by ATAFU/UNION ISLANDS cds and struck at top LAST DAY OF ISSUE in red. TOKELAU - 1946 'Peace' issue 'First Day' cover used at ATAFU. 1946 (NO.4.) 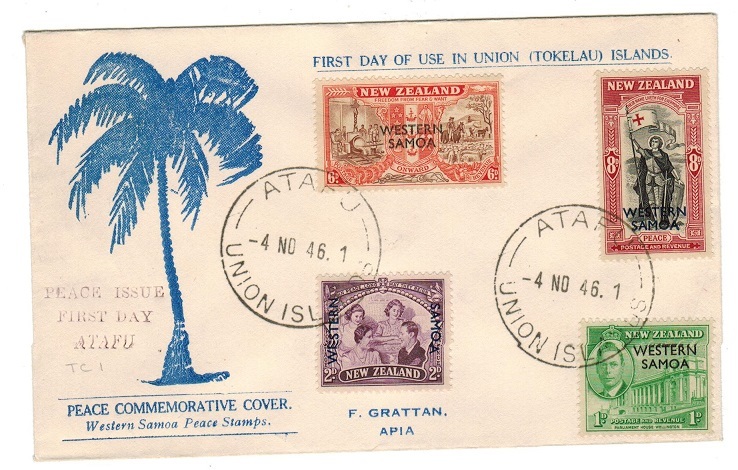 illustrated 'First Day Of Use In Union (Tokelau) Islands' cover addressed to Apia in Samoa and bearing the Samoa 'Peace' set of four tied by ATAFU/UNION ISLANDS cds with violet PEACE ISSUE/FIRST DAY/ATAFU h/s applied at lower left corner. 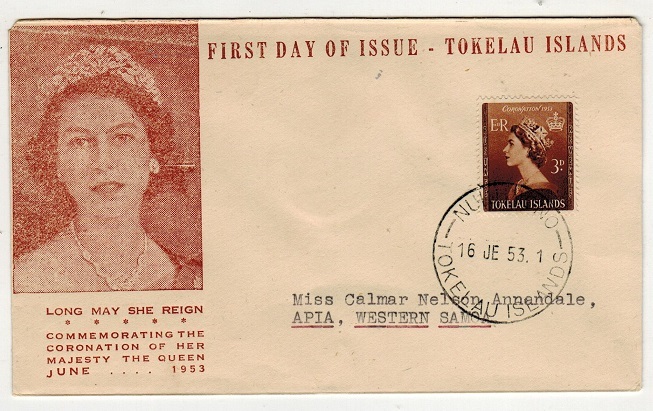 TOKELAU - 1953 'Coronation' first day cover from NUKUNONO. 1953 (JE.16.) illustrated 'Coronation' cover addressed to Samoa bearing the 3d 'Coronation' adhesive tied NUKUNONO/TOKELAU ISLANDS. TOKELAU - 1948 first day cover from NUKUNONO. 1948 (JE.22.) illustrated first day cover bearing the first issue trio (SG 1-3) tied by NUKUNONO/ TOKELAU ISLANDS cds. TOKELAU - 1956 1/- on 1/2d on FDC. 1956 (MR.27.) first day cover of the 1/- on 1/2d overprint adhesive tied by NUKUNONO/TOKELAU ISLAND cds with violet FIRST DAY ISSUE/TOKELAU ISLAND/OVERPRINT cachet applied at left with the unoverprinted 1/2d adhesive inserted in cachet to show the withdrawn stamp. TOKELAU - 1935 Samoa 1d 'Silver Jubilee' adhesive used on piece from FAKAOFA. 1935 (DE.12.) piece bearing 1d lake 'Silver Jubilee' adhesive (SG 177) tied by FAKAOFO/UNION ISLAND cds. A very rare use of this Silver Jubilee stamp used at Tokelau. TOKELAU - 1931 SWAINS ISLAND cover to American Samoa. 1931 (MAY.15.) 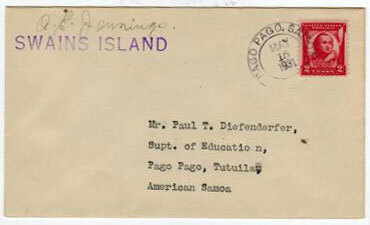 cover addressed to American Samoa struck at top left by violet SWAINS ISLAND h/s and signed above by A.E.Jennings. The cover then having US 2c postage stamp applied and cancelled by d/r PAGO PAGO. SAMOA cds on arrival. Swains Island being part of the Tokelau group. Passage to Apia Samoa is now accepted as being via the 'Tamarina' (Captain Stenbeck) where it was then conveyed to Pago by the 'Tiafau'. Burge type 1. Swains Island was privately owned but annexed to Samoa in 1925. It's population in 1931 was just 99.